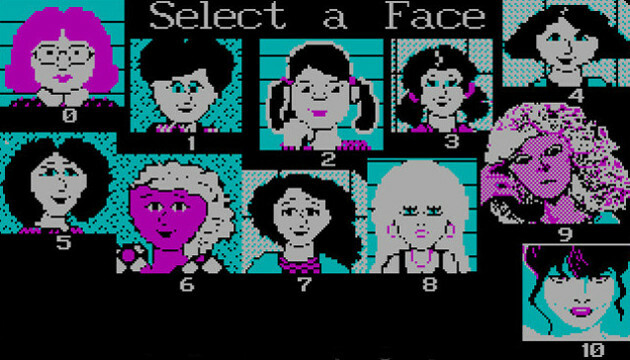 Long ago, in the dark, desolate year of 1989, a man named Tom Scheffler created a game called Girlfriend Construction Set. It’s a title some might decry as a lonely man’s daydream; a game for guys who need simulations to land dates However, those who look beyond its off-putting exterior will discover an addictive and fascinating retro gem. But the core of the Girlfriend Construction Set experience lies not in the girlfriend you create, but in the dates you take her on. See, your character has his own set of attribute points, which he can use to attract better girlfriends. If your dates go well, your points will rise, and you can trade in your old lady for a shiny new one. I thought that Girlfriend Construction Set would be a piece of cake; a bit of MS-DOS goodness I could easily master. But as it turns out, constructing girlfriends is far more difficult that it seems. When I dumped Robotica, she didn’t seem that broken up about it, but that didn’t help my flagging attribute points. I decided it was time to start fresh. This time, I’d take things in a bold new direction. Instead of dating fantasy ladies, I’d date someone a little more real — myself. I queued up a new game, and set out to create the most accurate Mandi possible. But before long, I ran into trouble. Although my attribute points were rising as intended, I didn’t have the heart to dump myself and start over. Mandi had become the Absolutely Safe Capsule of imaginary girlfriends. The relationship had fulfilled its purpose, but I was still trapped within its safe confines. And so, we stagnated. We continued to go on the same boring dates, where I selected the same boring dialogue options. When I decided to mix things up with a trip to Acapulco, we spontaneously decided to get married. Naturally, this was a mistake, and I wound up getting taken to the cleaners by a fictional version of myself. My attribute points were gone, and so was my pride. Since then, I’ve made many more girlfriends, but none of those relationships have been successful. I’ve tried taking my ladies shopping, tried taking them to hockey games, and even tried getting them involved in political scandals. No matter what I do, nothing seems to work out. Girlfriend Construction Set isn’t some weird game for the permanently dateless; it’s genuinely creative and legitimately entertaining. The script is hilarious, the gameplay is challenging, and even the weaker aspects of the game are pretty fun. But the more I play it, the more I realize that I’m just not cut out to construct girlfriends.